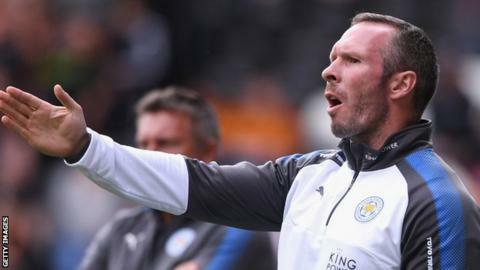 Leicester City's players are "a bit raw" following manager Craig Shakespeare's sacking, says caretaker boss Michael Appleton. Shakespeare, 53, was sacked on Tuesday four months after he took charge on a permanent basis. "Having spoken to the players today, they are obviously a bit raw as you can imagine," said Appleton, 41. "Craig is a little bit raw as well, but I'm sure he'll start reflecting and looking forward positively." Leicester, Premier League champions in 2015-16, are third bottom of the table after failing to win in their past six games. Shakespeare took charge on a temporary basis following Claudio Ranieri's sacking in February, and signed a three-year deal in June. On Thursday, Shakespeare issued a statement via the League Managers' Association thanking the club's owners "for giving me the opportunity to manage this fantastic club". Appleton, who was assistant manager under Shakespeare, refused to answer questions on whether he would like the role permanently. Wales manager Chris Coleman and Burnley boss Sean Dyche are among the contenders to replace Shakespeare. Dyche said it is "no story", adding: "I'm not aware of any approach. I'm more focused on what I am trying to achieve here. "It is not first time I have been linked with other jobs. I have been flattered. It is a form of recognition." Leicester, who have not won away from home in the league this season, travel to Swansea on Saturday. "I hope the players don't need lifting," said former Portsmouth, Blackpool, Blackburn and Oxford boss Appleton. "I don't believe there is unrest. The group is very positive despite a tough start to the season. "It's a good dressing room. There are hungry players who want the opportunity."